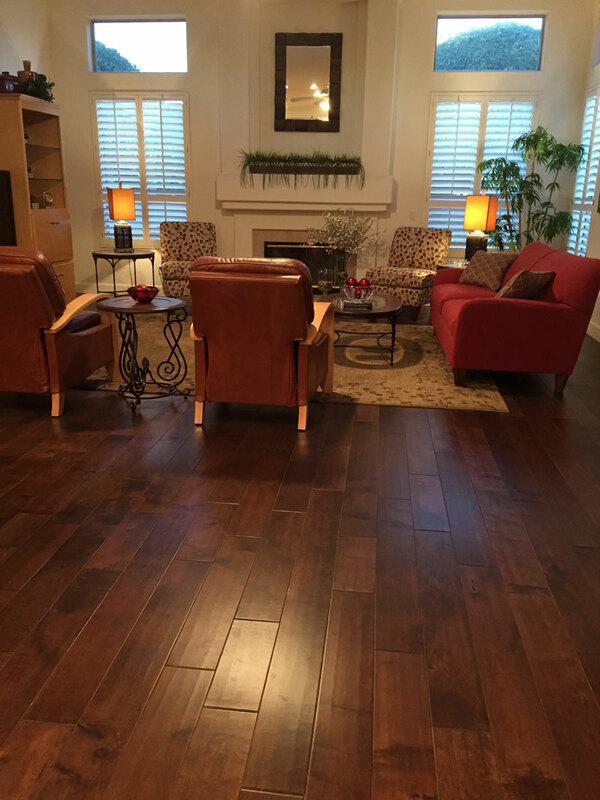 Mrs. W came to us in 2005-2006 where we first installed an oak flooring in her home. We must have done something right because 10 years later Mrs. W came back and decided she wanted to update her home again. She wanted a look with a bit more pizazz because she was thinking of putting her home on the market in the next few years and wanted something to catch potential home buyer’s eye. Mrs. W went to our Scottsdale showroom where she ended up working with the same estimator she had back in 2006. She checked out multiple samples and ended up selecting the Rewards Crown Collection Maple Kalua. The material has a subtle texturing that provides visual interest without the full rusticity of traditional hand scraped flooring. The maple is durable and holds up well under traffic and the wood has a luxurious feel that will catch the attention of the most refined eye. The installation took 2 to 3 days and looks gorgeous!